There are few things in life that are perfect. Katelyn Ohashi’s floor routine on January 12, 2019 is one of them. 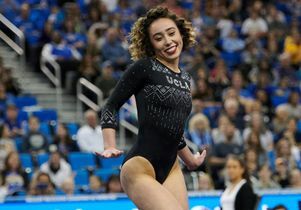 Performing to a mashup of Earth, Wind and Fire, Janet and Michael Jackson, and Tina Turner, Ohashi pulled off an infectious, dance-and-flip-filled routine that had her teammates on the UCLA women’s gymnastics squad and the audience cheering wildly. 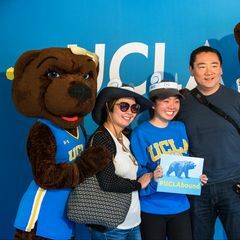 The judges agreed, awarding her a perfect 10.0 score that helped UCLA win the 2019 Collegiate Challenge. It was an auspicious start to the new year for the UCLA senior, who won the 2018 Pac-12 Women’s Gymnastics Specialist of the Year award after having scored a national-best three perfect 10s on the floor. The routine itself was also an expression of Ohashi’s joy in the sport, which had not always been a given for a performer once on the Olympic track (she is one of the last to beat U.S. gold medalist Simone Biles in competition). Beset by injuries and the pressures that come with the sport (her poem about body shaming was on “Good Morning America”), Ohashi made the brave but challenging decision to step away from the Olympic track. She reinvested herself in UCLA’s program, led by the innovative choreographer and former ballet dancer Valorie Kondos Field (“Miss Val”), and rediscovered her passion. Ohashi’s performance joins a line of spectacular, widely popular routines that have brought gymnastics to a viral stage, a line which includes that of former teammate Sophina DeJesus, who made waves doing the whip and the nae nae on the floor, and her own 2018 performance to a Michael Jackson medley that had her teammates dancing behind her. With each routine, Ohashi makes it clear that it can, and should, be primarily known as a joy. Watch Katelyn talk about her career in her Players' Tribune feature below.